When a message source contains more than one inbound endpoint to feed messages we use <composite-source>. In our example, we have combined a vm with an http inbound-endpoint. Each endpoint in a composite message source will start a new flow execution as soon as it receives a message. 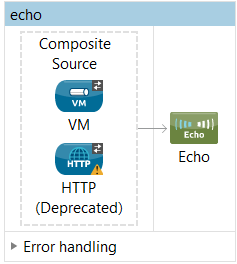 Both vm and http endpoints use request-response exchange pattern but there is no constraint on exchange-pattern. The inbound-endpoints can use whichever exchange pattern they need to. For simplicity sake, we just echo the message we receive. In order to kick in the flow, we send messages to vm:/in as well as http://localhost:8888/in. This was an example about Mule’s composite-source element.